Shaft Length: Required Choose Options -1" -.5" Standard +.5" +1" +1.5" +2"
Get the Cleveland CBX Wedge at the lowest price from Just Say Golf. Just Say Golf offers the Cleveland CBX Wedge in custom specs at no extra charge. Cleveland Golf's most forgiving wedge, the CBX Wedge, ships free from Just Say Golf. 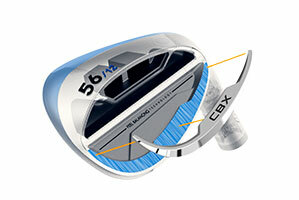 If you play cavity backed irons, you'll love the new Cleveland CBX Wedge. It's forgiving and playable like your cavity backed irons, but unlike other game-improvement wedges, the CBX still provides excellent feel, spin and touch around the greens. 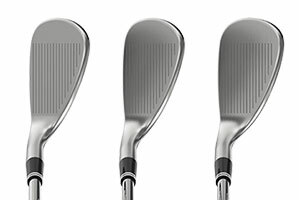 The Cleveland CBX Wedge is a perfect match to the rest of your iron set. Cleveland is the company that has dominated the wedge market for decades now. The CBX joins the Cleveland Wedge family for 2018. This year Cleveland is offering tour-level wedges like the RTX-3 Black Satin, RTX-3Tour Satin and RTX-3 Tour Raw. Cleveland's RTX-3 Tour Satin CB is a blend of clean tour lines with a little extra forgiveness. If you're looking for a great trouble wedge, check out the Cleveland Smart Sole 3 S sand wedge and for help around the greens there's the Cleveland Smart Sole 3 C chipper. Just Say Golf carries them all. 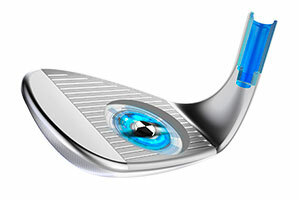 Get great spin from the Rotex face. Excellent forgiveness from the cavity-back design. Dual V Grind Sole provides maximum forgiveness on ground contact. Feel Balancing Technology provides excellent feel in a forgiving wedge. Cleveland's Dual Sole provides forgiveness at ground contact and versatility for a clean shot on a wide variety of lies. The CBX Dual Sole is V-shaped from front to back to provide easy turf interaction and flow smoothly through the rough. 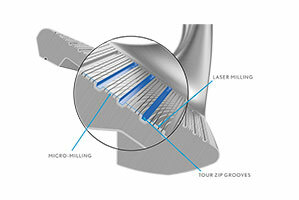 The heel-to-toe V-Shape, allows the player to open the face for high, soft shots or a little help from the sand. 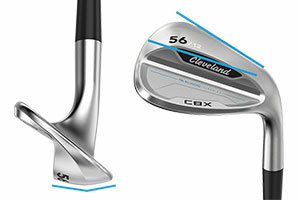 The Cleveland CBX Wedge features Cleveland's legendary Rotex face design. Cleveland face technologies like Zip Groves, Laser Milling and Micro Milling for incredible spin from a variety of lies. The groves of the CBX channel away the debris for excellent spin, even from the rough. 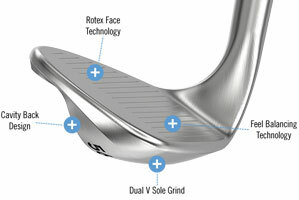 Feel Balancing Technology provides consistent feel on shots struck all over the CBX wedge's face. The microcavity inside the sole effectively lightens the hosel, moving the center of gravity toward the center of the clubhead. Enhancing the club's feel and distance control. Because the weight is shifted away from the hosel, you'll get improved forgiveness across the hitting surface. Progressive sizing the CBX Wedge means these wedges pair up perfectly to the progressive sizing of your cavity backed iron set. From the leader in wedge technology, the Cleveland CBX Wedge. I really like for feel and ball contact I receive from the CBX Wedge. The ball flies quite high and the accuracy is awesome.